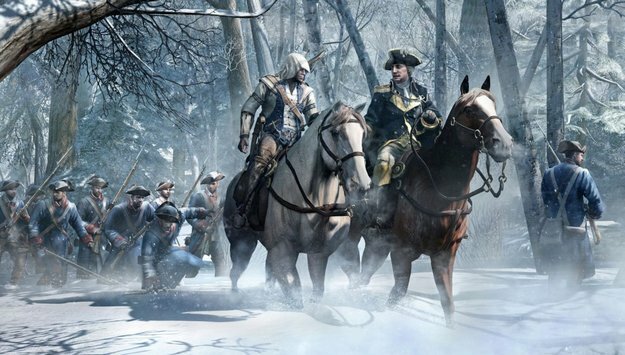 Noch vor Weihnachten gibt es einen neuen Assassin’s Creed 3 Patch, der hoffentlich auch den letzten nennenswerten Bugs den Garaus macht. Neben einigen generellen Fixes, wurden auch bestimmte Missionen überarbeitet und der Multiplayer-Modus verbessert. – Boston Underground: fixed a bug where exploded barrels could come back if you re-entered through the South Commons entrance. – Liberation Missions: added unfogging of the map when the player gets near a liberation event, to make sure the icon will be revealed in case the player doesn’t complete it and wants to come back later. – New York Liberation Missions: fixed a few cases where the player could get to the event’s icon but nothing would happen. – New York Underground, fixed a bug where the player would be teleported at the center of New York if he declined to enter the underground through the South Market entrance. – Side-quest „ENCYCLOPEDIA OF THE COMMON MAN“, fixed a bug where the quest would still not be completed if the problem was already encountered prior to the last patch. Buggy savegames are now fixed on load. – Fixed a bug where it was impossible to hide the on-screen money counter and „hold to skip“ message. Money is now linked to the „mini-map“ HUD visibility option, and the skip cinematic message to the „controls“ option. – Map icon filters: added a bunch of side-quest start icons on the missions layer, added viewpoints to the collectibles layer, and made sure all fast travel destinations are visible on all layers. – Team modes balance is no longer affected when extra players join in progress. – Players are no longer stuck after they got hit by knives while climbing cranes. – The Unstoppable Perk now correctly opens recently closed Chase Breakers in the Animus Core map. – Closure now seals and opens Chase Breakers for the player who used the ability as intended. – Abstergo points now update correctly after you finished a game in the progression menu. – Locked targets don’t become unavailable under certain conditions anymore. – Players will now see the notorious lock indicator when their pursuers kill NPCs, regardless of their approach meter. – In a chase, target players will now be able to lock their pursuer by default prior to any other character. – It is now possible for players to reopen Chase Breakers right after their team mates went through them in the Animus Core map. – The time during which you’re vulnerable after a stun from ground to a haystack doesn’t vary from one mode to another anymore. – Players can no longer get killed by another player from any distance after performing a haystack kill. – Players no longer get stuck in the position the character adopts on narrow ledges when they kill with the Fast Gun. – Players will no longer see their pursuers as notorious when their pursuers are killed with the silent bonus or better. – Characters appearance and Gamertags can no longer be accidentally reverted on Wolfpack podium staging.